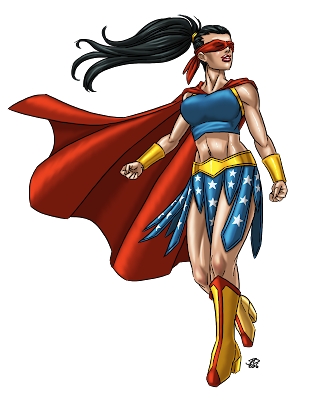 Since I started reading over Prowlers & Paragons Ultimate Edition I have wanted to come back to one of my favorite characters, Astra Kal-El, aka Justice. 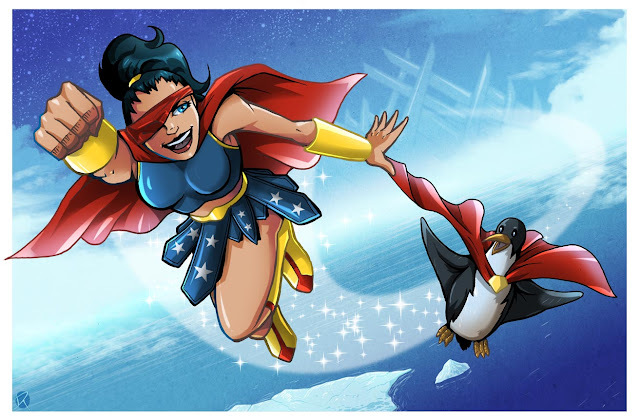 I introduced Justice waaay back in 2011 as the daughter of Superman and Wonder Woman. 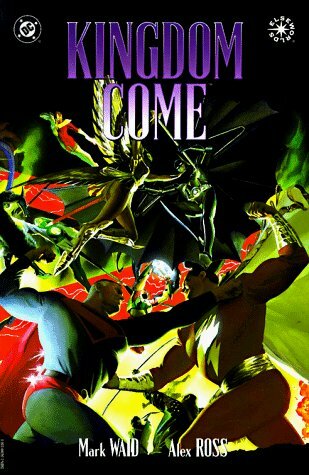 She was inspired by my favorite comic Kingdom Come where Superman and Wonder Woman eventually have children after the death of Lois. Astra was raised by the Amazons but sent to be fostered by Bruce Wayne where she learns to be the superhero Justice. 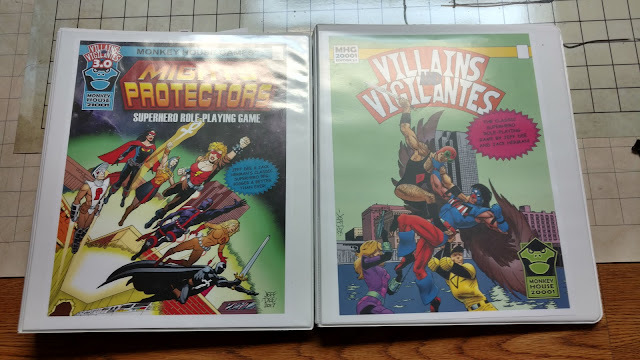 Mighty Protectors is billed as Villains & Vigilantes 3.0. For the most part, I am completely fine with that. The game feels the same and mostly plays the same. There are differences though. 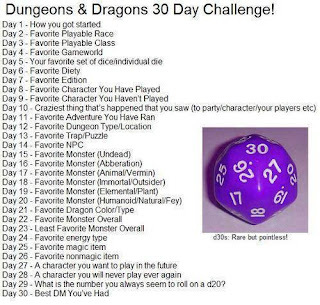 The differences feel about the same as those say between AD&D 1st Ed and D&D 3.0. The numbers don't always line up in terms of CPs or BCs, but close enough that you can do what I call "concept-driven conversion". Concept Driven conversion (for me) is a matter of reading over the character (monster, spell, adventure) and re-casting it in the new rules. This is different than what I call Numerical Conversion where I can lump the numbers into an Excel sheet and get the proper conversion. I tried both ways on characters I had been using for Villains & Vigilantes 2.x; Justice and Tarot. I do want to point out that neither of these characters can be considered "mine". Justice is derived directly from Superman and Wonder Woman, both owned by DC comics. Tarot is owned by Jim Balent and Holly Golightly and she is very near and dear to them. In the case of Justice I went with concept driven conversion since I knew I wanted to recraft her from the ground up as a 200 CP character. To recap, Justice is also known as Astra Kal'El or Astra Kent. She is the daughter of Superman and Wonder Woman in the future. I have toyed with the idea of having her go back in time to stop the death of Lois Lane but that would also erase her conception..so problems there, but none that I can't solve really. I like the idea of a young Kryptonian/Amazon. True, I get a lot of my Justice fill lately from the Supergirl TV series, but this is still a fun character. This Mighty Protectors version of her is not as powerful as the Villains & Vigilantes version I made a few years back, but I am much happier with it. She is powerful but still just starting out. For Tarot, I wanted to do a more numerical conversion. She was one of the last characters I stated up for V&V 2.1 and thought she would make a good first character for Mighty Protectors. Trouble is I didn't like the conversion I came up with. So I smoothed out some of the edges with some concept-driven ideas and good old-fashioned number juggling. Comparatively the MP and V&V 2.1 versions are much closer aligned. Well...in truth the paper sheet I have is much closer. 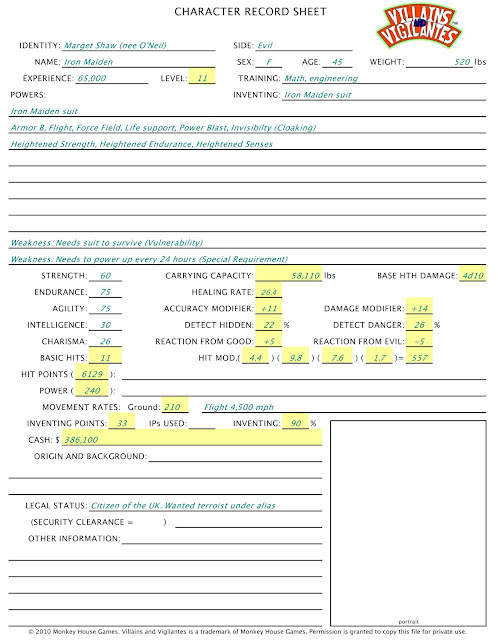 The Excel sheet shows more of the "smoothing". From a 13th level character to a 200 point build. Again I am pretty satisfied with this one but the 2.1 version is just as good to me. Besides. Tarot is way too fun NOT to have in a game. Not much happing today. That is good. So here are some things that have attracted my attention. My son has been playing Skyrim since it came out. Well I guess they have a bunch of mods out for it now on the Xbox so he has been playing more. I told him when I could get a witch hat to let me know. It came out near the start of the year so this is the character he helped me make. The "Elder Scrolls" version of Larina. Not really the most appropriate adventure gear really. 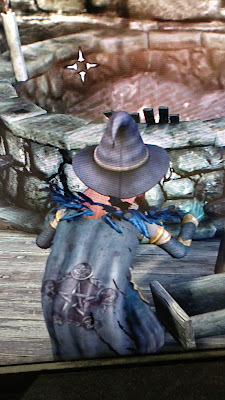 This is the "Witch Armor". The tattoos are actually the armor. I have to admit I like the colors and really dig the pentagrams. 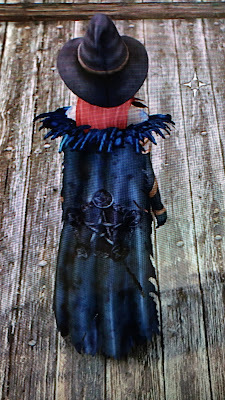 The feathers on the cloak are a nice touch as well. This image appeared on my Tumblr feed. It reminded me I need to do more with my own Astra, the superhero known as "Justice". I should get my supers game going some more to get Justice some more game time. That's easy. 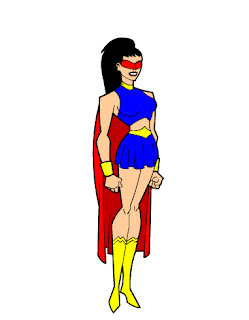 My character Astra Kent, aka Justice. I have stated her up in a number of systems but I have not had the chance to play her at all. Ok ok. 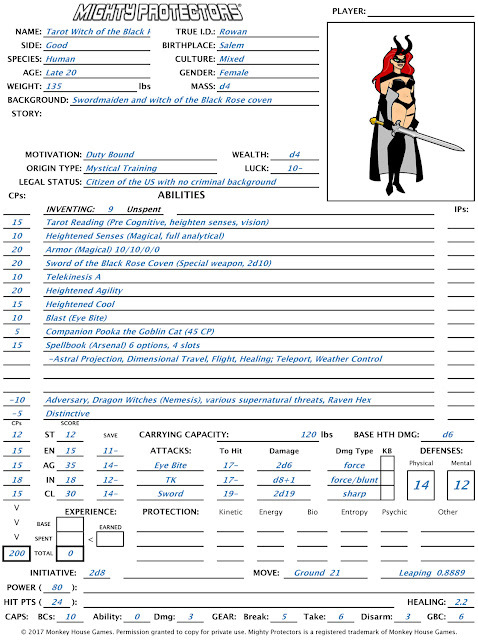 So she is technically not a D&D character. But she is the one. 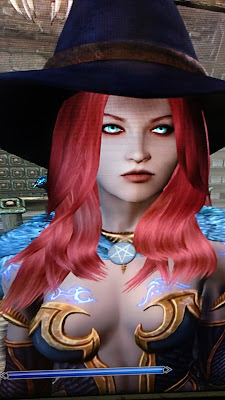 I have wanted to play my witch Larina under Pathfinder (closer to D&D) but I have not found a good group for that yet. Today is the Heroes & Villains Blogfest hosted by Jackie and Dani. This is Part 2 of my post for that, Part 1 was posted earlier today. I want to continue talking about Villains & Vigilantes I thought it would be interesting to bring back my superhero character Justice and introduce her new arch nemesis. 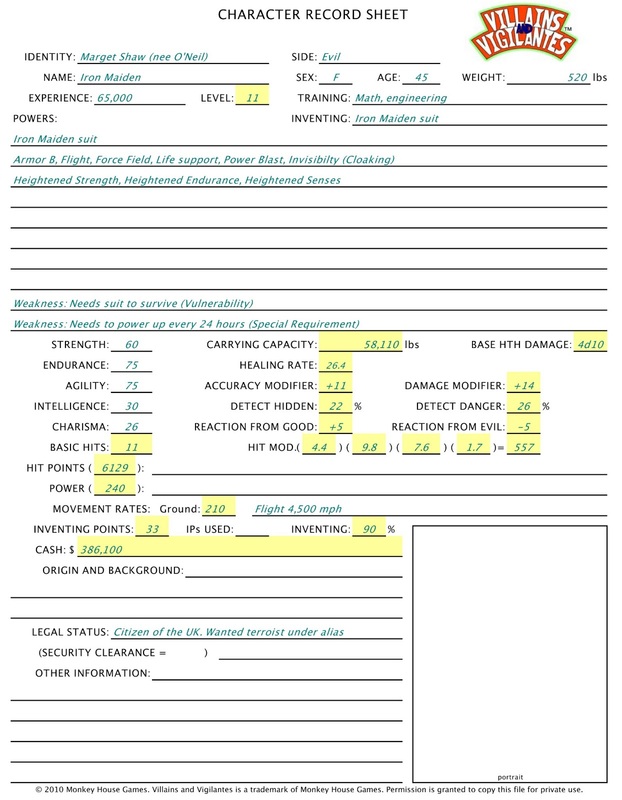 To bring everyone up to speed Justice is a character I created for the Mutants & Masterminds RPG for a game we were going to play that day. Her real name is Astra Ka-el, aka Astra Kent and she is the daughter of Superman and Wonder Woman. I based her off the last few pages of the comic Kingdom Come, which deals with the superheroes we know in about 20 or so years. I won't spoil it all for you. Read it, it is fantastic (or watch this fan made trailer). But one of the futures they point to is the possibility of Superman and Wonder Woman having a daughter. You can read the back story I did for her in "Issue 1: Justice is Blind". The last time we saw Justice was Issue 5. In Issue 6 I wanted her to go to London where she could potentially run into the legendary, but retired, Acrobatic Flea. This serves a number of purposes. It gets her to England to meet her new arch-nemesis, it ties in Villains & Vigilantes and it gives a shout out to +Tim Knight (the Flea himself!) who has been wanting me to do more with V&V forever. So I introduced my hero. Here is my villain. Maggie "Mags" Shaw nee O'Neill aka "The Iron Maiden"
Maggie O'Neill was a plain, if brilliant girl, who lived in one of the poorest areas in Belfast, Northern Ireland. Maggie hated being poor, she hate being scared all the time (the Troubles were at their height) and she wanted nothing more than to get away. To her that mean London. After a car bomb destroyed the bus she was supposed to get on for school that morning (no one was killed) she had haad enough. At age 14 she ran away from home and made her way to London a couple of months later. The education she had on the road was a hard one, and it hardened her. When she got to London she was "discovered" by a talent scout looking for young, and maybe disposable, girls for modeling. Mags, as she called herself now, quickly turned a would-be tragic situation to one where she was on the cover of every fashion magazine by 16 and a national and tabloid celebrity by 18. She used her keen intellect, charisma and complete lack of moral center to get to the top of the heap. Her looks, while plain as a child, transformed her into "The Face of London". Her name even became so synonymous with magazine covers that people thought it was a play on words. In her 20s her career took a dip when she tried acting and was terrible. Same with pop songs. She quietly completed degrees in mathematics, engineering and robotics while people suspected she was out partying. At 24 she stunned the world when she married multinational billionaire Halloran Shaw, depiste being nearly 40 years younger. She took a keen interest in his business and became a full partner and soon rose (by much of the same combination of lack of ethics and keen intelligence) to a position of VP and a seat on the board. Her enemies begrudged her polished public image and despised her ruthless private one. When Shaw died he left everything to her including controlling stock in his company, locking out his own grown children. Mags would have had it all had it not been for a PR stunt gone tragic. Shaw International was responsible for making high capacity batteries for cell phones and small electronics. Their factories though were located in India and were the worse sort of sweat shops. Thousands, cramped into small spaces to build batteries with caustic chemicals. Ventilation was poor, and deaths were common, but as they were the only employer for hundreds of kilometers she had all the workers she could want. Protest groups caught news of this and were making a stink. Mags herself went to the factory to hold a press conference. Most of the employees where cleared out (with out pay) so tours could be given. In the midst of this pr stunt the factory exploded. The death toll was high, but would have been much higher had it not been for Justice, who had been near by and heard the explosion with her super hearing. One person though she didn't save, because she didn't know, was Mags. Mags watched and Justice saved all these people, while she was pinned under tons of rubble while chemicals and fire burned her skin. Mags was found, alive, but the damage was too great. For a year she was in the hospital. She lost her legs, an arm, part of her face, some the fingers on her other hand. She eventually recovered, but swore she would have her revenge. The news (thanks to a healthy pay off) made the claim that eco-terrorists caused the explosion, so popular opinion was for the "poor woman" who had "lost everything". Secretly Mags has built herself a suit of armor that not only keeps her alive, but also enhances all her physical stats. She has been using it to steal what she can't buy or make herself. She has killed and seems likely to do so again. Though no one suspects that the armored thief the tabloids call The Iron Maiden is really Mags Shaw. And no one know that she is building a weapon to kill Justice! Here they are in their Villains & Vigilantes glory. Justice and her arch nemesis The Iron Maiden! There might be errors here. It has been years since I played V&V. I have been really, really negligent in keeping up with posts on my supers character Justice. In fact it looks like the last time I posted about her was March. So I do plan on posting some stats. But in the mean time here is something to keep you entertained. A commission from my friend David Reynolds of ShadowGirls fame. Not sure what the Penguin's name is yet. But I do know she finds him in her father's Fortress of Solitude. As for Stats, I am hoping to do some FASERIP/Marvel/4C, Super Babes, Villains & Vigilantes and some Capes, Cowls and Villains Foul. Earlier this week I mentioned I spent some time over the last month with Marvel Heroic Roleplaying. One of the first characters I though about was my paragon character "Justice". The great thing about Justice is I have a great grasp on who this character is, what motivates her and what she wants to be. So a game like MHR is really a good fit. 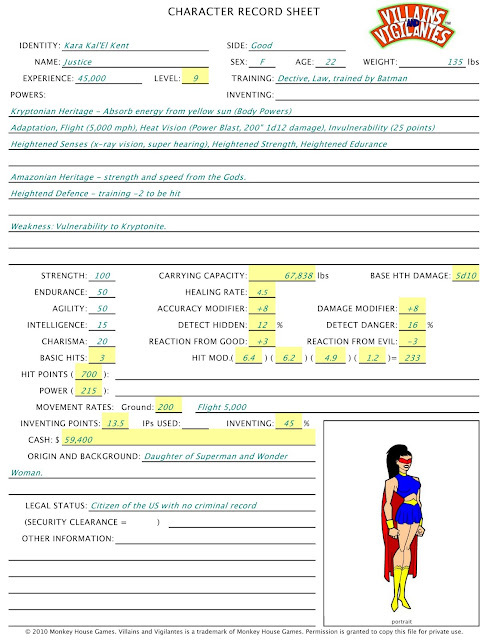 Plus is gives me the chance to compare her "Marvel" universe counterpart with her "DC Universe" counterpart. For Issue 5 I spoke to my regular GM Greg, the guy likely to be the GM of any supers game I'll play in and my go to guy for Marvel questions, suggested an adventure where Kara travels to Madripoor. Kara is there as part of a delegation with one of her law professors. Her role here is of course to be quiet and learn. Bet you know how that is going to turn out. Since we are going to focus on the drama here Greg wanted to give her a love interest, one of the local criminals (whose name escapes me at the moment, but I think it was Wolverine's son). So with out further ado, here is Justice. 3xp You defeat one of your father's or mother's old enemies. 10xp You join or leave a team that your parents were on. 10 xp You choose to see justice done at the expense of your own personal happiness. I think this describes her rather well to be honest. 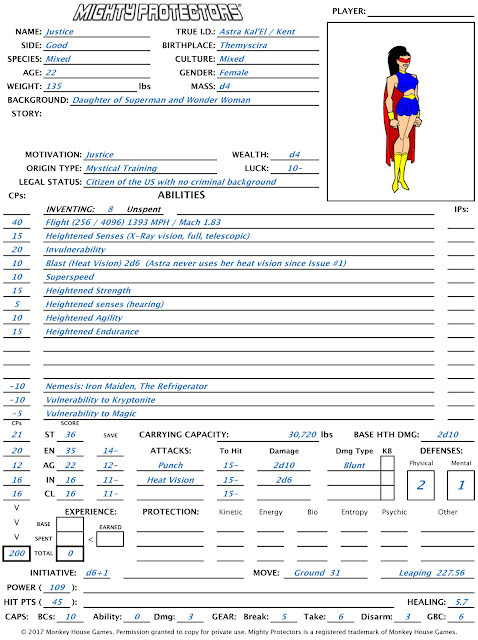 And it is something I could use to help drive the character in any other Supers game she might be in. Continuing on my development of a "new" superhero I want to first talk about a few things from my first post on Justice. I see Justice as a very conflicted sort of hero, but not angsty. She is conflicted because she wants to do good, but is unsure what is the best way to that. She knows she has a duty because of who her parents are and she has obligation because of who she is. One thing that Justice is really needs is a nemesis. All good heroes are defined by their enemies. For the moment I'll leave that one to my GM. Though I did just finish Batwoman: Elegy and I am thinking that the best nemesis for her would be her own twin sister. Justice is sort of my anti-Witch. She is smart, yes, but she is strong and has no affinity for magic whatsoever. So this makes for a character that is more physical than I have done in the past. Since this is a new character I think I need to use the game that was my first new game of 2010, BASH!. BASH is a pretty simple system. Basically it is kind of a modified point buy with points determined by the campaign setting. Pretty common for a supers game. The mechanic is kind of an odd one with multipliers (but I think it works for supers) and exploding doubles on 2d6, which I admit I like. It also has a cool FASRIP-looking chart for die results, so it gives it an old school feel (something all old school supers games had were charts, lots of them!). I like that the main Abilities have been reduced to just three; reminiscent of Tri-Stat, but these a Brawn, Agility Mind (BAM!). Everything after that are skills and powers. It has it's legions of fans and that is cool and I can see why. I don't know if I'll ever play it myself. 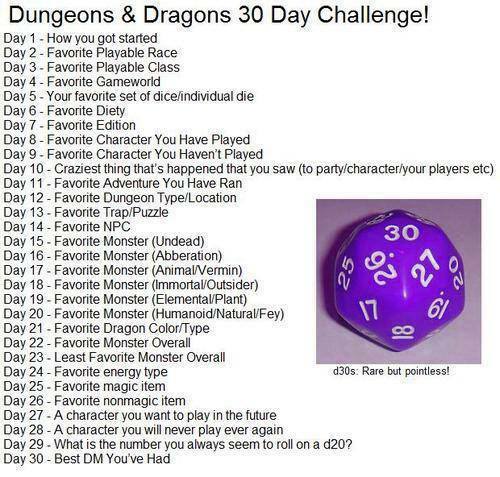 I'll try it out one day to be sure, but if and when I do, I have a character ready to go. Here is Justice based on a 40 point game. Again I like the picture being put together here. If this was an on going narrative, Issue #1 (Mutants & Masterminds) focuses on her powers and how much she is like her parents. Issue #2 here (BASH!) then is told in flashbacks to talk about her training as an Amazon and then her later training with Bruce on martial arts and how to be a detective. Issue #3? Well not sure yet, either Icons or Villains and Vigilantes. Either way tune in next time for the exciting new adventures of Justice!